Is it too early to call this idiocy ‘Trident-Gate’? Michael Fallon refused to say if the test went wrong – even as CNN said it did [Image: Getty]. Theresa Mayfly will be flying over to Washington DC soon, to be the first foreign leader to have a meeting with new US President Donald Trump, and what has he done? His administration has admitted that a British nuclear missile test failed catastrophically, even while Mrs May’s defence minister, Michael Fallonyoursword, refused more than 12 times to confirm or deny the story. I wonder what Mr Trump (I need a good nickname for him) and Mrs Mayfly will discuss? I mean, normal people wouldn’t contemplate a trade deal when one of them had just admitted that their most expensive product – Trident is costing us more than £200 billion, people – doesn’t work… Embarrassing the other one in the process. But they’re not normal, are they? And it isn’t their money on the line, is it? 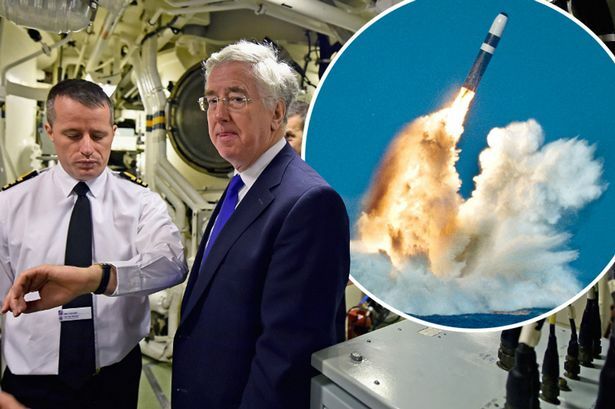 Defence Secretary Michael Fallon faced derision from MPs – even a prominent Tory, those who back Trident and Speaker John Bercow – after being warned his silence undermined Britain’s nuclear arsenal. He confirmed there was a “routine unarmed Trident missile test launch” last June, just a month before MPs voted to renew the £31bn nuclear weapons system. Yet he refused more than a dozen times to confirm or deny details in the Sunday Times, which said the missile veered off course towards America. Farcically, even as he was speaking, CNN revealed claims by a US source saying the test DID go wrong – and its veering off-course was part of a self-destruct sequence. Needless to say, some of our friends on Twitter have been having the time of their lives. What we know Cameron lied over Panama Papers, Gove & Johnson over Brexit & now Theresa May over #Trident telling us all Tories are liars. Instead of spending £billions on weapons that "veer off course", we could invest in education, infrastructure and protecting health care. What the Tories #trident cover up reveals about Theresa May and her gov't is they care more about power than the defence of Britain. The Lockheed Snake Oil Salesmen must be rubbing their hands with glee. Making multi-billions from the UK for a non-functional Trident system (refitted recently in Dec 2015) as well as flogging us loads of F-35 aircraft with new problems occurring every single day according to the RAF. P.S, Trump needs no nickname, we all know in the UK that a Trump is something offensive emanating from an a**hole. Your point about the system being refitted in December 2015 is an excellent one. People have been saying the debate was about buying an updated system, but this shows that the system has been updated – and didn’t work. Mike “I need a good nickname for him” – how about Big Chief Breaking Wind? I don’t like it because it associates him with Native Americans, and not in a decent way. Point taken Mike. How about just using his given name: Drumpf? I understand he loathes it. Just call him Donald T Rump or Mr T Rump. Or Windy Miller (from Trumpton). I quite like “Donny Tiny Hands” myself ??? The idea of tests is to well, test, you can learn more from a failed test than you can from one which goes completely to plan, and the missile would have been destroyed no matter what they are after all single use weapons. You certainly can learn more from a failed test. 9 Trident Missiles have misfired since the 1980s. The last successful Trident Missile test in the UK was 2012. UK tested just 10 since 2000.